You find the weirdest stuff on Facebook. This morning, I stumbled across a new Facebook page that is dedicated to the idea of reclaiming the color blue for Republicans. At first blush, I thought this was one of the silliest things. But then, I started thinking about it. Why would the GOP want the color blue versus red? Isn’t red the traditional color for Republicans? Not unless you consider “traditional” as the last 15 years. The page creators argue that for more than a century, Republicans were routinely associated with Blue and Democrats with Red. That color association was changed, they say, by NBC journalist Tim Russert in 2000 when he assigned Red to Republicans on his electoral map. Since then, they say, the media has adopted this formula, even though it runs counter to American history and worldwide practice. Are they right? 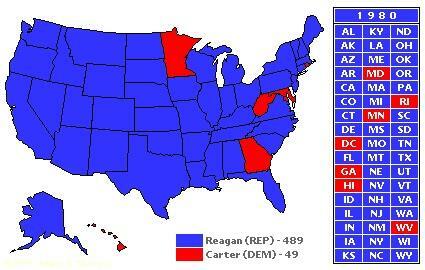 Well, take a look at the map that NBC used to portray the 1980 presidential election results between Ronald Reagan and Jimmy Carter. But do colors really matter? Color is a form of non verbal communication. It is not a static energy and its meaning can change from one day to the next with any individual. For example, a person may choose to wear the red one day and this may indicate they are ready to take action, or they may be passionate about what they are going to be doing that day, or again it may mean that they are feeling angry that day, on either a conscious or subconscious level. Experts say the color red can cause people to feel rushed, agitated or angry. The color blue, on the other hand is generally associated with serenity. It is also associated with trust, honesty and loyalty. So, given this information it becomes easy to see why Republicans want to “take back” the color blue. And what about the rest of the world? Are Social Democratic political parties generally red and center-right parties blue? That would be true in a wide range of countries, including Finland, Israel and the Czech Republic. In fact, the more you look, the more you will see that conservative or centrist parties are associated with the color blue around the globe. But I don’t expect the U.S. Democratic Party to go down without a fight in the upcoming color war. After all, the last thing Democrats want is to be associated with the color red (Think Soviet Union, the Red Invasion and all sorts of other negative stereotypes. Who changed the color? Was it a mainstream media with a liberal bias? Was it an oversight or an intentional switch by the GOP? There’s a lot of conflicting information out there, but one thing is for sure: you can always find some strange stuff on Facebook, which relies on the color blue. How many Bobby Vinton songs had the word “blue” in it huh? huh?